This striking basket of tropical flowers reflects your warmest thoughts to all who are in attendance. Perfect for the service or home. 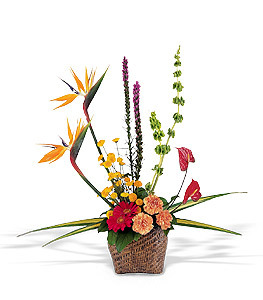 One arrangement arrives with red anthuriums and orange carnations, along with bells of Ireland and birds of paradise, in a decorative basket. Page loaded in 0.5152 seconds.